Companies often view Maintenance and Reliability activities (M&R) as optional components of an operation. That short term view, cutting maintenance costs to save money, can have significant safety, legal, and financial ramifications in the long term. 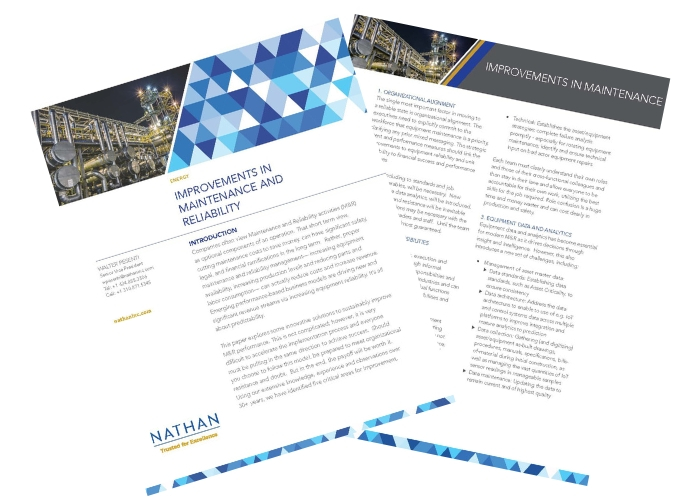 Rather, proper maintenance and reliability management— increasing equipment availability, increasing production levels and reducing parts and labor consumption— can actually reduce costs and increase revenue. Emerging performance-based business models are driving new and significant revenue streams via increasing equipment reliability. It’s all about predictability. This paper explores some innovative solutions to sustainably improve M&R performance. This is not complicated; however, it is very difficult to accelerate the implementation process and everyone must be pulling in the same direction to achieve success. Should you choose to follow this model, be prepared to meet organizational resistance and doubt. But in the end, the payoff will be worth it. Using our extensive knowledge, experience and observations over 30+ years, we have identified five critical areas for improvement.